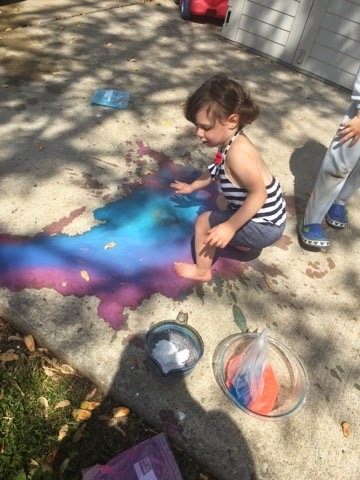 We celebrated Memorial Day with our erupting sidewalk paint! We chose to use red and blue to be patriotic and pretended that the ‘explosions’ were our fireworks! 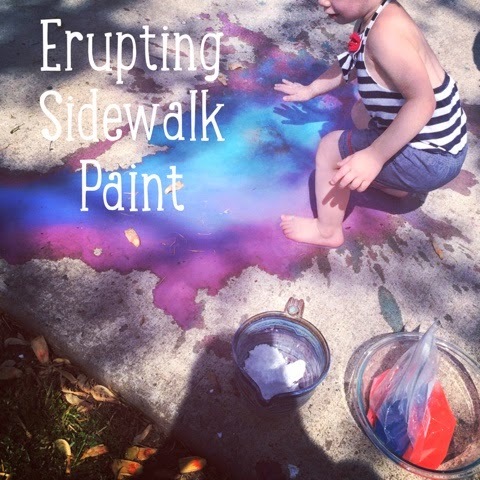 I love anything do to with sidewalk paint so when I came across Growing a Jeweled Rose’s post on Exploding Paint Bags, I decided that by tweaking a few things we could use this with our sidewalk chalk paint. 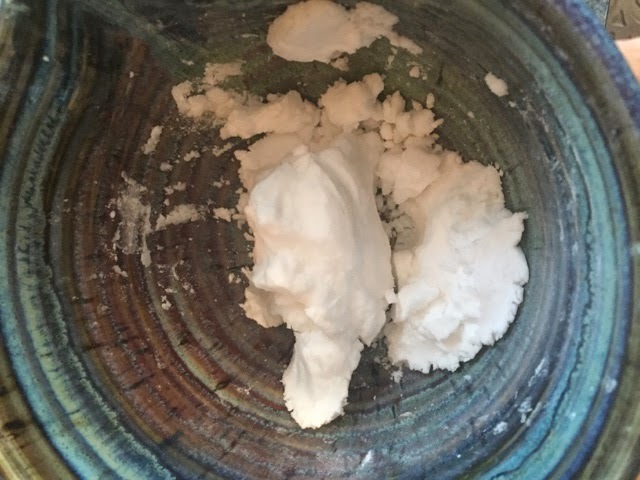 To see how we make our simple 3-ingredient chalk paint, read here. I don’t typically measure things when we are doing projects or activities, so I’ll try to give you a rough idea here. First I gathered 6 quart size Ziplock bags. I figured by having a few of these ready to go the kids could really go to town with this activity! 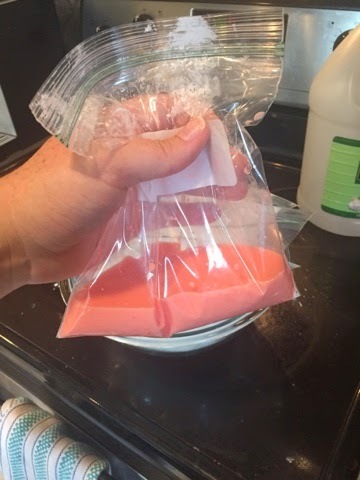 To each bag, I added some cornstarch (around 2 tablespoons) and then enough vinegar to fill the bag about 1/4 of the way. If you add more vinegar then the eruption will be even bigger! 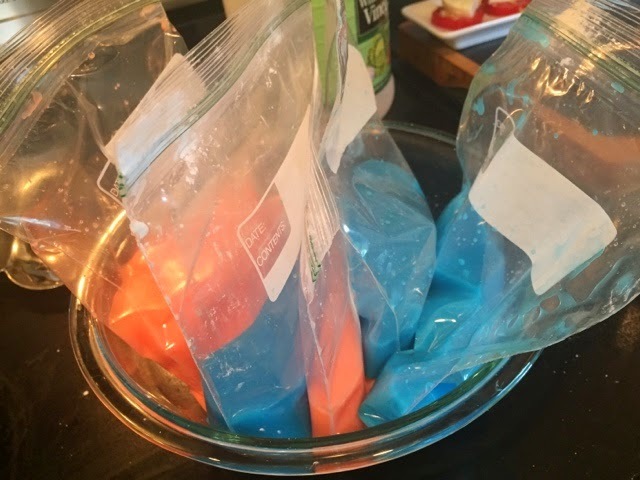 To the bags, I then added our food coloring, sealed the bag, and gave it a good shake to mix it up! 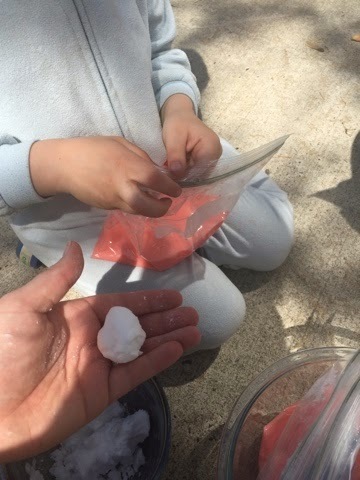 We needed to add baking soda to the bags to create the eruption, but I knew the reaction would be fast and pouring baking soda in might take too long and the bag would erupt before we got a chance to seal it back up. 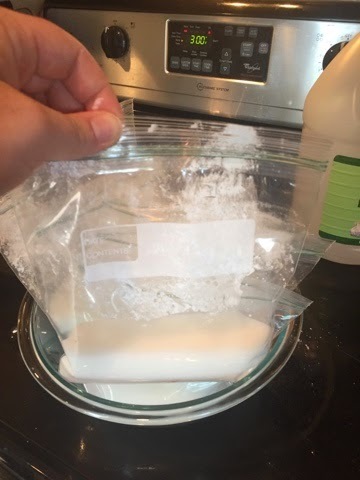 To avoid this, I put about a cup of baking soda in a bowl and added just a bit of water to moisten it to so that we could form little balls to quickly drop into the bags. This worked very well. Once everything was prepped, we took it outside for some Memorial Day fun! 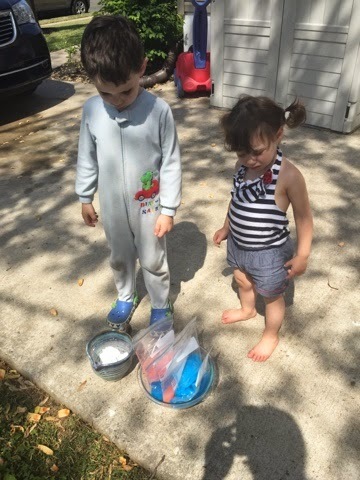 I unfortunately don’t have a good picture of the bag ready to erupt but the kids enjoyed the process and were very happy that we had multiple bags to pop!